Residents of Kaohsiung have long awaited the completion of the underground railway line through their city. Running from Zuoying District in the northern part of Kaohsiung to Fongshan District in the municipality's southeast, the railroad took more than a decade of planning and construction. The underground line, which replaced a stretch of ground-level tracks, finally began operations on October 14 this year. This railroad beneath the streets is set to alter the cityscape in more ways than one. What is more, it further integrates Kaohsiung's public transportation systems, closely interweaving Taiwan Railways Administration (TRA) services, Kaohsiung Rapid Transit, Kaohsiung Light Rail Transit, and Taiwan's High Speed Railway. Travelers can now transfer from one system to another more quickly and easily. TRA's Kaohsiung Train Station and Kaohsiung Rapid Transit's new Kaohsiung Station now share a co-constructed four-basement-floor station. Previously, while the underground railroad was under construction, passengers had to use Kaohsiung Rapid Transit's temporary Kaohsiung Station. Many train buffs with fond memories of the old station took a farewell ride on the last train, which pulled in alongside the old platform at 12:28 am on September 5. Kaohsiung Rapid Transit Corporation had made online announcements about this special journey, attracting the attention of railway enthusiasts. 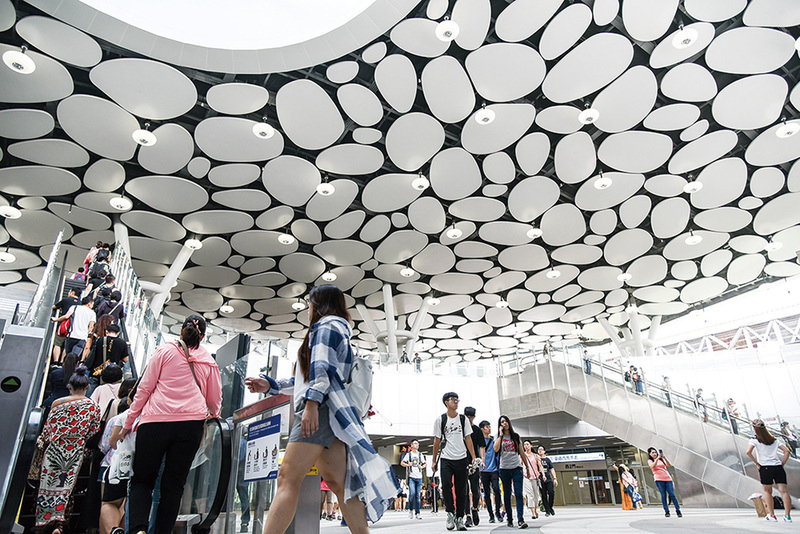 Kaohsiung Rapid Transit's new Kaohsiung Station (R11) is one of the three busiest stations in the city, serving more than 30,000 passengers per day. When travelers enter the new Kaohsiung Station building, passengers wanting to take a Kaohsiung Rapid Transit train pass the ticket barrier on the third basement floor, then take an escalator one level down to where they can board trains. Those who wish to use TRA services go through the ticket barrier on the first basement floor, then get on the train on the second basement floor. In addition to the stations, the new building has convenience stores, gourmet shops, coffee shops, bakeries, souvenir stores, and other retail businesses. Many commuters pause to admire the installation art on the canopy, visible from the first basement level if you look up. 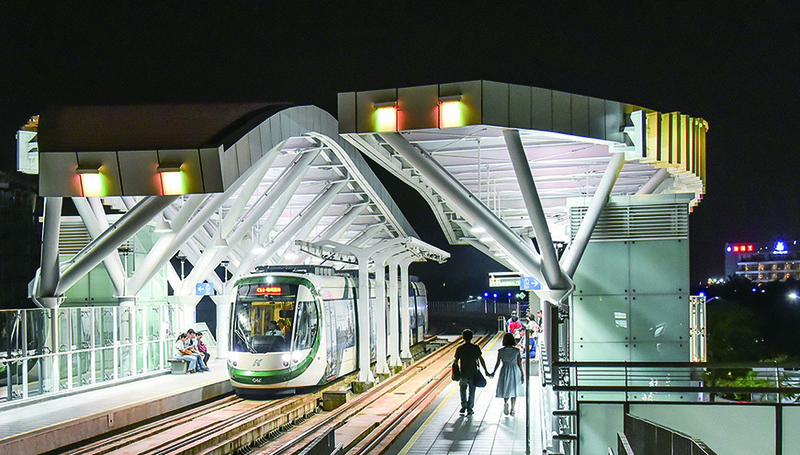 Kaohsiung's underground railway line is 15.37 km long, and the project has transformed three ground-level stations (Zuoying, Kaohsiung and Fongshan) into underground train stations. At the same time, seven new underground stations (Neiwei, Museum of Fine Arts, Gushan, Sankuaicuo, Minzu, Science and Technology Museum, and Zhengyi) have been added to make it easier for commuters and tourists. Not all of these stations are brand new. Sankuaicuo Train Station was first opened in 1908, during the period of Japanese colonial rule. Following the opening of the original Kaohsiung Train Station in 1941, Sankuaicuo Train Station fell into decline. The old Sankuaicuo station was decommissioned on September 26, 1986, but the new Sankuaicuo Train Station preserves a ground-level Japanese-style wooden structure that was designated a national relic in 2004. The entrance and exit gates of the new station incorporate the old wooden building. The new Sankuaicuo Train Station is close to Sanfong Jhong Street, famous for its dried gourmet goods and snacks. Placing the railway underground is expected to revitalize the area around Sankuaicuo Train Station, and the land where the old ground-level tracks once ran will be beautified with trees and plants. The official opening of Kaohsiung Rapid Transit on March 9, 2008 saw the inauguration of the Red and Orange lines. The former runs north to south, while the latter runs east to west. Part of the Red Line (between Ciaotou Station and World Games Station) is elevated. Kaohsiung Rapid Transit has not only introduced convenient public transportation but also boosted the prosperity of peripheral areas, including neighborhoods near the Red Line's Gangshan South Station and the Orange Line's Daliao Station. As rapid-transit use grows, the city government has been operating the Kaohsiung Light Rail Transit, the first light-rail system in Taiwan, since September last year. When its circular route is complete, Kaohsiung Light Rail Transit will have 37 stations and 22.1 km of track. The first phase from Lizihnei to Hamasen has 14 stations, and the second phase should be ready by mid-2019. The light rail offers panoramic views of the city's river and ocean landscapes. Completing Kaohsiung's transportation networks is central to the city's progress toward sustainable development. The photo is provided by information Bureau,Kaohsiung City Government and taken by Chung-Hui Pao. Kaohsiung City Government © 2013 Kaohsiung City Government. All Rights Reserved. Best view with IE10.0 plus or Edge、Firefox、Chrome.